What is a mindful classroom? How does it work, and how does the concept fit into teaching and learning? Most importantly, what does it mean for our learners? Teaching in a mindful classroom can help students remain calm in stressful situations. It encourages them to think clearly when confronted with academic challenges. Additionally, it will shape their demeanour in future situations and may positively affect their character. "Teachers do not create learning; only learners create learning. Teachers should respond to student performance to guide the learning process. This happens through mindful assessment, being conscious and in the moment, seeing the situation clearly and using assessment to confirm or create this clarity." A good way to describe mindfulness is to say that it is based on both awareness and acceptance. When you are being mindful you are focusing your awareness on the present moment. In addition, you are accepting of your thoughts, feelings, and bodily sensations without critique or judgement. This is why mindfulness meditation is so often used as a therapeutic technique. The majority of assessment that happens in schools is summative rather than formative. Unfortunately summative feedback in the classroom only provides a sense of finality—a number that represents the sum of learning. To be clear, there's nothing fundamentally wrong with this type of assessment. It's just that we must be careful to take it in the context of what it is—a snapshot. As such, it's an incomplete reflection of a student’s total learning experience. After all, how can we possibly (and fairly) appraise a student’s entire learning career with the results of a final exam? How, then, do we bring mindful assessment to a mindful classroom? Ultimately, it's best to focus on formative assessment, which is the best form of assessment for the modern digital learner. It fits much better with student needs and with the teaching and learning outcomes schools have in place. 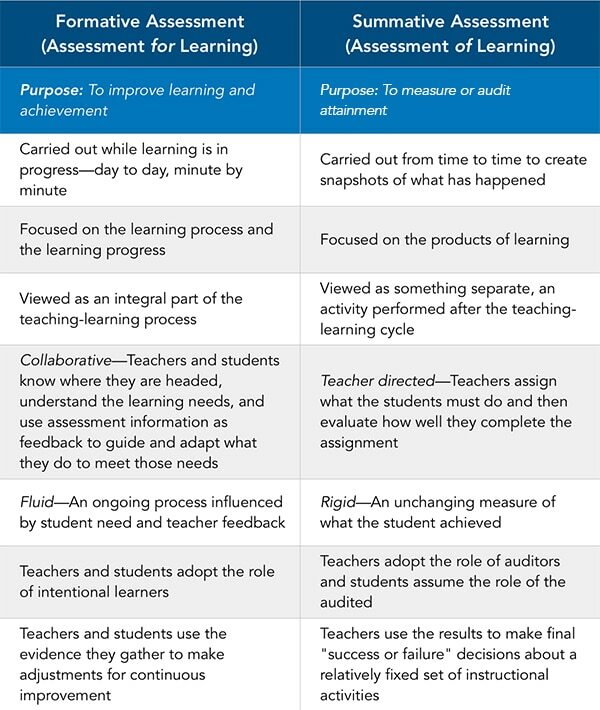 Here we draw a comparison between formative and summative assessment using a simple chart. It demonstrates that formative assessment is designed to lead to self-discovery and foster transformational lifelong learning. For these reasons it fits much better in the mindful classroom than its summative counterpart. Consider, for example, a teacher who returns a marked quiz to the student that includes a simple number such as 7/10. Now let’s reimagine this example with mindful shifts. Instead of a quiz, the teacher presents the questions one at a time, and the students attempt the answer. The students then break into groups in which at least one member understood the concept. They work collaboratively on the activity to reduce the gap, supported by their peers. The teacher presents the next question, and new groups are assembled. These are mindful shifts that transform a simple quiz into a rich and collaborative learning activity. Teachers can apply these kinds of shifts to instruction and assessment in all stages of learning. As the students are also helping to lead the learning process, this reinforces their own learning. The mindful classroom is developed and maintained in a constant state of practice. In addition to these exercises, simply bringing awareness of the mind at points during lessons and throughout the year can foster mindfulness in your students. The bulk of resources on the Internet mention or highlight meditation as a means to cultivate a mindful classroom. Students may use this technique on their own during the day. When teaching meditation, it might be good to start with guided mediations, walking them through the process. Here's how you would do that. Download some meditations of various lengths. Starters could be 5 minutes. They may be recordings or scripts. Explore your students' willingness and experience. Encourage them to give it a try. It's up to them and shouldn't be forced. Highlight the benefits. Stress a feeling of safety and no judgment placed upon anyone. Have them close their eyes. If you are skilled, you can try delivering the meditation yourself. Be sure to allow for a lot of space, and end the meditation gradually. Discuss feelings after the meditation, their willingness to try again, their willingness to try a longer meditation, and how they can use meditation on their own throughout the day. Feel free to share the recordings with students who are willing. The Mind in a Jar project involves obtaining or creating a "snow globe" and having it ready when stress begins to set in. This can be made using a jar, glitter, food colouring and some kind of oil/water mixture. When you shake a snow globe, the glitter is upset and begins confusedly swirling around and clouding the tiny scene. This represents your mind in stress. Watching the snow subside and fall back down to the bottom helps you to enter a state of mindfulness. It's intended to make you aware of your thoughts, to be settling and calming, and to allow for clearer vision. This is a great strategy for people of all ages to bring stress outside of the mind and into a space where they can watch stress fade away. Here's a simple sensation awareness exercise found on Mindspace using chocolate. Whatever food you decide to use, make sure there are no hidden allergies among your young ones. Each child is given a chocolate (upon determining no one is allergic) and told not to eat it yet. Notice the wrapper. Does it crinkle? Is it shiny? Is it colorful? How does the wrapper make you feel? Unwrap the chocolate. Are you excited? Or not? Smell the chocolate. How are your senses responding? Does your memory take you somewhere? Put the chocolate in your mouth but don't eat it. Think about the sensation of the chocolate melting. How does it make you feel? As the chocolate melts, where do you taste it on your tongue? Breathe in through the nose as you taste your chocolate. Does inhaling enhance the experience? Swallow the chocolate. What are your feelings? As you finish your chocolate off, just be aware of your feelings. How was this different from your general chocolate-eating experiences? More intense? Frustrating? More pleasurable? Were you more aware of your emotions during the exercise? Would this change your future experience of eating chocolate? Why?